The RS 5 rolls in on some additional wheel options and a Black Optic package that’ll further set you apart in your V8-powered Audi. With all-wheel-drive (AWD) chops and one of the most attractive designs on the road, adding 450 hp and V8 rumble to an Audi is sure to produce a drool-worthy package. But it’s not just the engine that’s an upgrade from the already-awesome S5, as the RS 5 gets a unique suspension, 7-speed dual-clutch automated manual, advanced AWD and some aesthetic enhancements that just might be worth the extra cash alone. Exclusive front and rear fascias hold air dams, dual oval exhaust outlets and air channels designed to make the most of the RS 5’s aero profile. An automated rear spoiler will deploy at speed to keep things nice and stable and retract once you decide to return to a less liberal use of force on the accelerator. Inside you’ll find a flat-bottom steering wheel, your choice of stainless-steel mesh, black piano or brushed aluminum trim, and optional sport seats for those that will truly be pushing themselves laterally. Which is easy to do in the RS 5, thanks to the Quattro AWD system, with its crown gear self-locking center differential, capable of modulating torque distribution between axles from the default 40/60 split to 70% front or 85% rear, making the RS 5 feel nearly like a RWD car. And while the RS 5 is slightly nose heavy with a 56/44 weight distribution, understeer is mitigated nicely with the stability control system and optional active rear differential, each capable of applying appropriate brake pressure to appropriate wheels during aggressive cornering. Still concerned about the handling capabilities of this beast? Add the dynamic damping system for the suspension to provide an extra bit of on-road security during your more assertive driving moments. But with its five-link front suspension and independent trapezoidal-link rear enhanced with a wealth of aluminum and nearly three-quarters of an inch of drop compared to the S5, even the standard setup provides plenty of confidence, if a bit too firmly. Twenty-inch alloys are available as part of the Titanium package, which also gets you body-color side mirrors and the Black Optic trim package with a gloss black grille surround and matte window trim. However, the 20-inch wheels seem to only compound the skittishness that can present itself over uneven pavement and should be avoided if your RS 5 will see anything other than track time. But let’s get back to that engine. A 450-hp, 4.2-liter V8 deserves respect, especially in naturally aspirated form. In an industry that is quickly being choked by turbochargers, superchargers and hybrids, a free-breathing V8 that’ll swing the tach needle up to 8,300 rpm is getting increasingly rare. Opt for the sport exhaust, and it’s a note seldom are still playing. The RS 5's 317 lb-ft of torque shouldn’t be ignored either, and with the quick-shifting 7-speed dual clutch being operated by paddle shifters, the car will zip to 60 in just 4.3 seconds in coupe form. Cabriolets are heavier and take 4.6 to do the same trip, but it’ll feel faster with the top down. Stop at the pump on your way home, and you’ll see EPA-estimated returns of 16 mpg city/23 highway for the coupe and 22 highway for the cabriolet. While I don’t usually recommend an optional navigation system, one of the most common complaints with the RS 5 is the operation of the standard MMI controller, versus the upgraded interface you get when navigation is ordered. The upgraded system is considered superior with regard to both hardware and software. Rear seats are also a sore spot, as they’re too stiff and lack the head- and legroom for full-size adults. Trunk space is a welcome surprise, however, even in the cabriolet. Because Audi deigned to fit the RS 5 with a soft top, trunk space drops only 2 cubic feet relative to the coupe’s 12.2—still plenty for luggage, groceries and more, and the convertible even shares the folding rear seats of the coupe for extra space, something most convertibles don't offer. 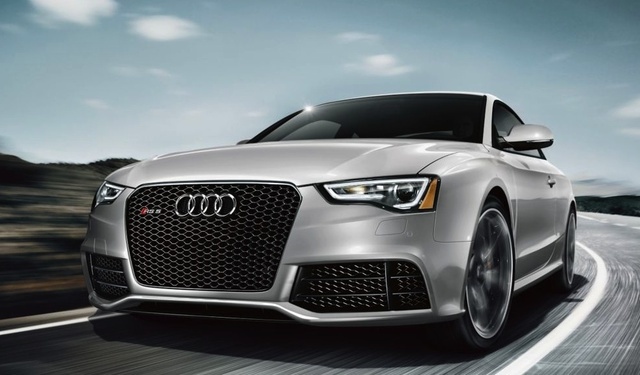 What's your take on the 2015 Audi RS 5? 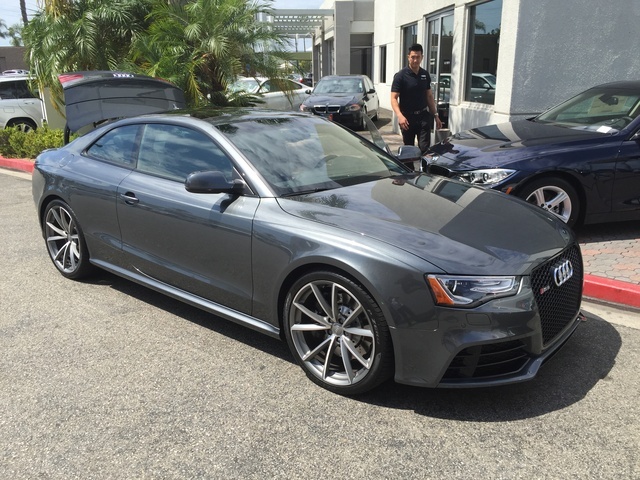 Have you driven a 2015 Audi RS 5?